American style commercial smokers UK built barbecue trailers. 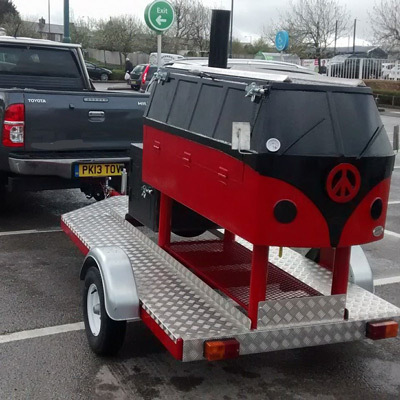 Custom made to your specification or built to our standard design, tow one away and your barbecue catering and hog roast business is pretty much up and running. 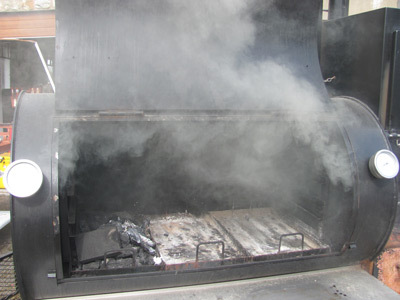 My smokers have all been designed as a result of the knowledge that I've gained through BBQ catering. That said, you may have some ideas of your own. I'm happy to discuss and draw up a design for you that exactly meets your needs. Imagine towing one of these beauties onto a food festival, town show or farmers market. With smoke billowing from the chimney, they certainly draw the crowds. The vehicle quality standardisation programme instituted by the United Nations dictates that every trailer constructed or sold in the UK after 28.10.2012 must have an approval certificate. This law has been introduced to crack down on the cowboy builders and doesn't just apply to a BBQ smoker trailer. Whatever trailer you are considering to buy the first question you must ask the builder is whether the trailer has an EC approval certificate. This certificate ensures that every component such as brakes, hitches, axles and lights has EC approval. Towing a non-approved trailer could land you in hot water if you were ever involved in an accident or indeed need breakdown assistance. As a small manufacturer we have two choices. Have every trailer we build inspected by UK government VOSA inspector. 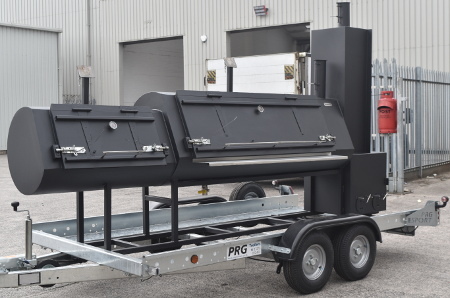 Buy from a reputable mass producer and build our commercial smokers on one of these. We choose option 2. 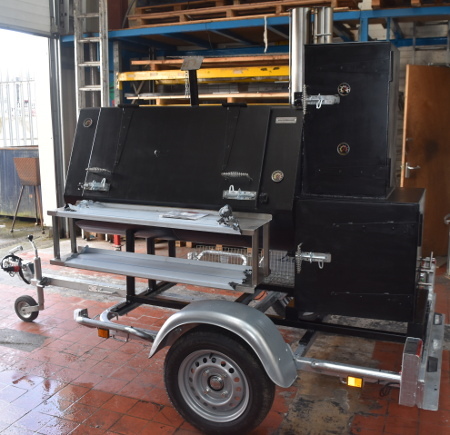 Our barbecue trailers are manufactured using an EU certified trailer chassis because this also means that our smokers look smart on a rust proofed galvanised frame. To the rear side there stainless steel baskets for equipment and fuel. This model is perfect for markets, shows and food festivals. 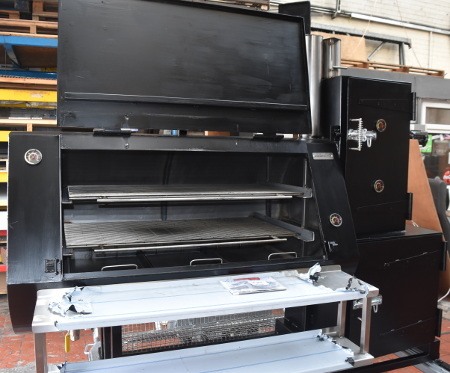 Built on a 3m long chassis (designed to sit to the side / under a standard market gazebo) this unit consists of a cylindrical main food chamber with flat front door which can be used either as a grill or reverse flow smoker, a large firebox with oven / smoker above. 1.4m long constructed of 3mm plate steel and 6mm end plates. 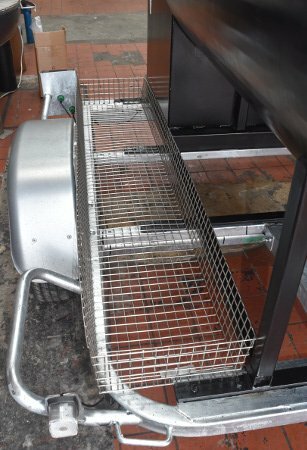 Internally there are drawers in the bottom used for charcoal when grilling and these same trays act as baffle plates when smoking. In addition there are 2 shelf runners and 2 professional grade type 304 stainless steel food grates for good hygiene and easy cleaning. At 1000mm x 450mm (approx.) you can cook a small hog on one rack and much more above or below. To the front there are also 2 type 304 stainless steel shelves making them easy to keep hygienically clean. The seating of a flat door delivers less smoke and heat leakage when in use. The door lip hinders moisture ingress whether in use or not in use - a lesson learned while cooking on a day of heavy rain showers! Sitting directly over the firebox is a cabinet containing 4 stainless steel shelves. You can fill these with meat or insert 420mm x 305 x 100mm deep roasting dishes (not included). 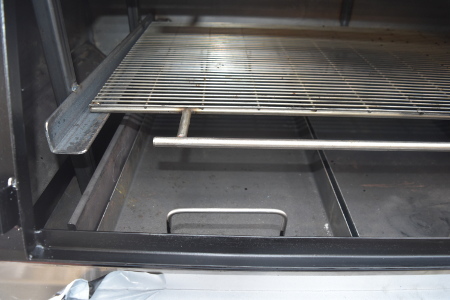 This cabinet can be used as a warming oven simply using the radiated heat from the firebox or with the help of the sliding gate damper between the two chambers the vertical cabinet can be used for additional smoking space or a high temperature (200°C) oven. In the top of the vertical smoker we have also installed a hanging rod for cold smoking. Constructed from 6mm plate steel includes 2 daisy wheel adjustable dampers with stainless steel levers, side access and an internal fuel basket. 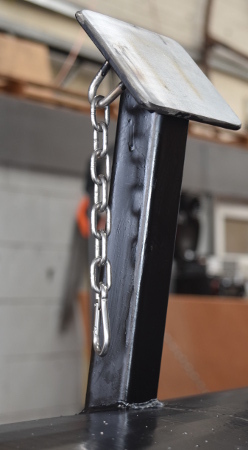 Our choice of 6mm steel reflects our commitment to quality and longevity. 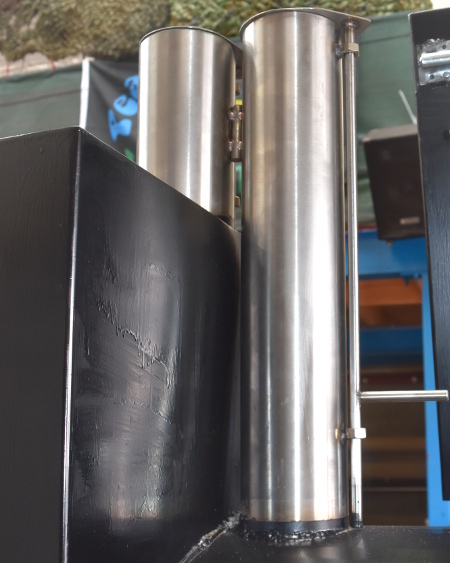 We want our product to last you a lifetime without the need to replace the firebox every two years because there’s a hole in it. 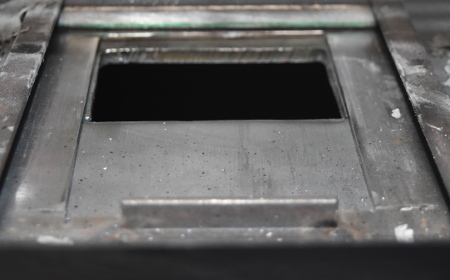 Beware of any smoker manufacturer using less than 6mm plate steel for a firebox. It's not just about hygiene and public safety, we want our trailers to look good too and the double stainless steel flue really helps make an impact. The safety of both you and your staff is also paramount. To that end the lid has a back stop and carabiner securing chain so there's no chance that the heavy lid can fall while loading the smoker. Finally to help the cleaning we have also installed a ball valve drain. Use a power washer to clean the internal chamber and then you can let the grey water drain out of the bottom into a bucket. Our commercial smokers UK built don't stop at the standard, we're happy to do bespoke designs. 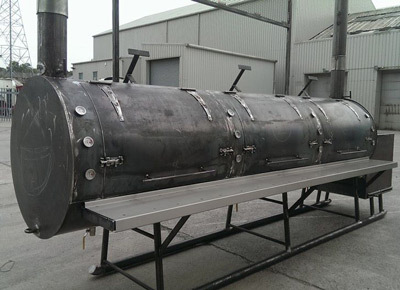 This one is 4.5m long and features a direct grill cabinet to the front. Stainless steel internals and a stainless steel shelf as you'd expect of course. If you have something in mind then please call us and we'll cost up your design. You'll find some more examples below. Dual pipe stainless steel flue with rain caps and stainless steel side storage basket. Call Paul on +44 (0) 7814 500755 and let’s discuss your individual requirements or request a call back using our rapid response form below. If you want our standard design then the ex-works price is £5,995 + VAT. including 4 x thermometers. A 50% deposit secures your order. Construction will take approximately 4 weeks and then you pay the balance and collect your smoker. Prices quoted are ex-works however delivery can be arranged. In order to fully understand your needs we will arrange a series of telephone meetings to discuss your ideas and pull together a number of drawings that diagrammatically depict the final construction. Once agreed, we will calculate the price. You sign off on the price and the drawings, pay a 50% deposit and we move into construction phase. Dependent on the size and complexity of the construction, this can take between 4 – 8 weeks. 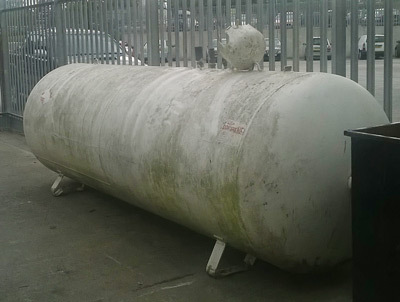 Seated on a double axle trailer we'll weld a 1m cubed firebox and make the full conversion to build you the biggest commercial smoker in the UK...have you got the imagination to put it to use? Contact Paul on +44 (0) 7814 500755 to find out more. 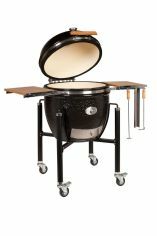 We have so far supplied our commercial smokers UK wide and also as far as Portugal. We speak a little French, Spanish and German so we’re sure that we can find a good way to communicate. Our user guide below will help you understand how to operate one of our American commercial smokers UK and determine whether it's the right piece of equipment for you to purchase. 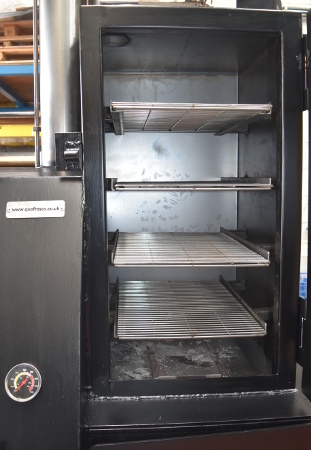 It’s worth starting by saying that large offset reverse flow smokers like these need care and attention to get the best out of them and once set up, any change, no matter how small will change the oven temperature and therefore necessitate monitoring and adjustment. In a smoker this size you need to use hardwood logs and preferably a log from a tree that bares fruit, do not use softwood (it makes your food taste awful) and make sure that your logs have been aged for at least a year. The aging process reduces the moisture content in the wood, having some moisture in the wood is actually a good thing because in a moist environment smoke particles clump together and are more likely to stick to your meat and impart flavour. When cooking your meat you’re looking for blue wispy smoke and this smoke comes when your fire is in a state of embers. Compare that smoke with the thick white smoke that you get at the start of combustion, cooking in this smoke will give your food an acrid taste. Take time to set up your smoker – typically our big trailers smokers need 90 minutes preparation before they are ready to cook on. 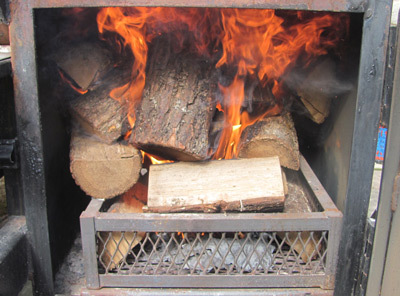 When replenishing the firebox, don’t add fresh un-burnt wood as this will turn your smoke white. Add pre-burnt wood, the best way to do this is have a separate fire pit burning fresh logs by the side of your firebox. When these logs break down into embers then it’s time to add them to your firebox fire. You’ll need to add a couple of logs more or less on the hour so keep 4 logs burning in your fire pit. To get your fire going, fill the firebox with wood, open the draft vents, open the chimney damper and keep your food chamber door open too. I always remove the stainless steel food racks so that they don’t get covered in black smoke particulates. After half an hour or so you’ll start to see the smoke change from black to white so now it’s time to close the food chamber door and bring it up to temperature. Make sure that the chimney damper is fully open during this time and remember it will take longer to do this in Winter when the ambient temperature is lower. 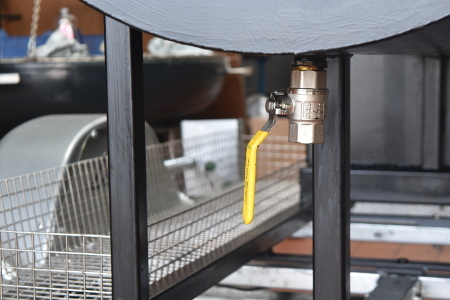 As the food chamber comes up to temperature you can start playing with firebox damper adjustment and use the chimney damper for fine tuning. 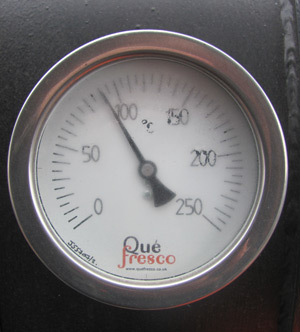 Our food chambers have thermometers on both sides so they will give you a good idea what’s happening in your food chamber but there’s still no substitute for a good remote thermometer to tell you exactly what’s going on in and around your meat. On the hour or when the temperature dips (less than an hour in Winter), add another couple of pre-burned logs. When you’ve finished cooking and whilst the unit is still hot, spray the inside with water to remove grease and scrub down. Open the gate valve under the tank to drain. You can pressure wash if you want but never add soap or detergent.